Pearls are such a popular choice for jewellery making and one of our favourites here at Kernowcraft. We supply an extensive range with an array of different types and styles. 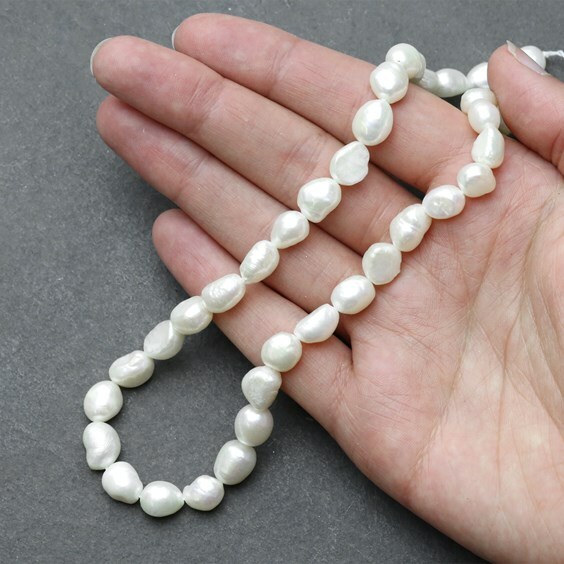 On this page we distinguish between the different types of pearls and answer all of your questions when it comes to working with them. A pearl is produced in the soft tissue of a living shelled mollusk - such as an oyster or a mussel. It is made of calcium carbonate which has been deposited in concentric layers. A pearl is formed when there is something irritating the mantle folds inside the mollusk - this is normally something such as a piece of grit or sand that has made its way inside. The mollusk begins to protect itself from the irritation by covering the piece of grit or sand with layers of nacre — the mineral that the mollusk's shell is made from (also known as mother-of-pearl). This process continues - layer upon layer - until the iridescent pearl is formed. Nearly all of the pearls on the market today are cultured. A cultured pearl is created by placing a piece of mantle tissue inside the mollusk which then deposits layers of nacre around the nucleus, dissolving it and creating the pearl. Naturally created pearls are extremely rare as only a small percentage of mussel will ever produce a pearl – it is said that one in ten thousand molluscs naturally produce gem quality pearls. This is why we culture them! It is still a natural process, however it has been instigated by humans. 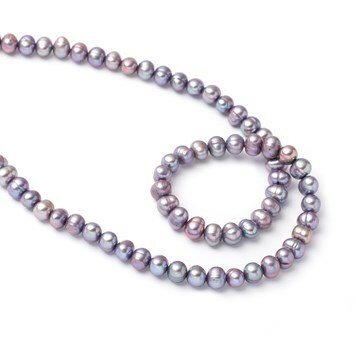 What is The Difference Between Cultured Freshwater Pearls and Cultured Saltwater Pearls? 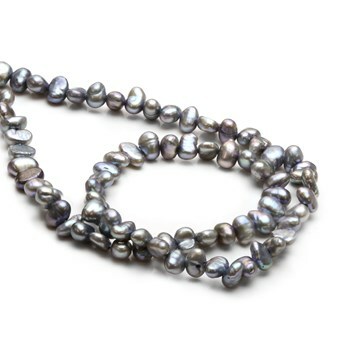 Cultured freshwater pearls are created using freshwater mussels. They come in a variety of natural colours but are also often dyed to create stronger and more unusual colours. Cultured freshwater pearls tend to be cheaper than cultured saltwater pearls as mussels can produce far more pearls per shell – typically between 24-32 pearls. 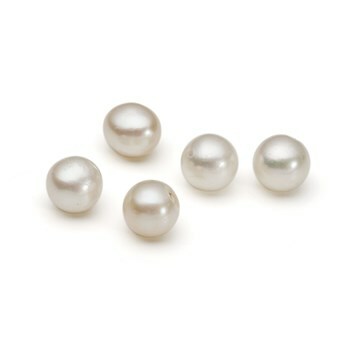 The quality can vary vastly, so we have carefully selected pearls that are good quality and have great lustre. 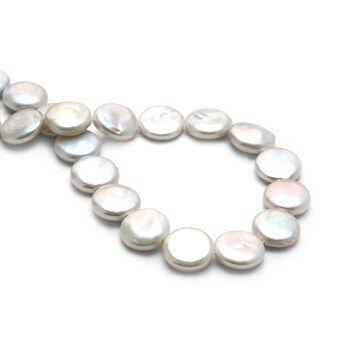 Cultured saltwater pearls are created using saltwater oysters. A shell bead (often mother of pearl) is placed inside the oyster which then deposits layers of nacre around the nucleus bead. They are better quality than cultured freshwater pearls and tend to be more round in shape due to the shell bead nucleus. They also have better lustre than cultured freshwater pearls. As with many cultured saltwater pearls, ours are created in Japan. 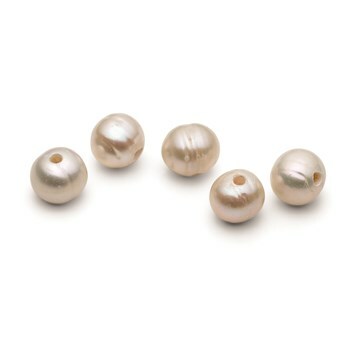 What’s the difference between the different pearl shapes? There are a range of different pearl styles for jewellery making which are often by-products of cultured pearl production - It’s hard to get a pearl completely round; for this matter the price jumps considerably for perfectly round pearls, especially with strands of pearl beads. It’s hard to get a pearl completely round; for this matter the price jumps considerably for perfectly round pearls, especially with strands of pearl beads. This is why some of our pearls are listed as ‘roundish’ as they are very close to being round, but without the price tag! Potato pearls are slightly cheaper as they’re still quite a good roundish shape but with some irregularities on the surface. These are fully drilled and available by the strand. This is a regular, oval shaped pearl that is longer in length than potato or roundish pearls. Again this is created in the same way as round pearls and is just a shape variation. Baroque pearls are both irregular and non-symmetrical in shape. They can be very abstract or just slightly irregular. The slightly irregular shapes are often referred to as semi-baroque pearls. Some pearls that might be considered as oval, button or drop pearls but are not symmetrical would be classed as a semi-baroque pearl. 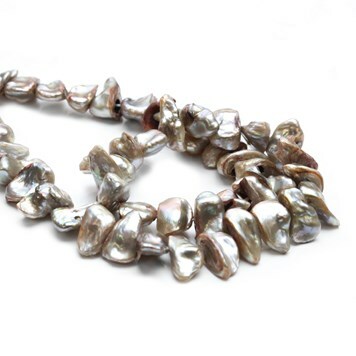 Keshi Pearls are accidental byproducts of pearl culturing in both saltwater and freshwater mollusks. Their shapes vary broadly and they come in a wide variety of colours and tend to have high lustre and unique characteristics. 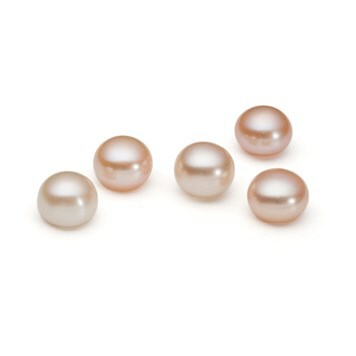 Coin shaped pearls are cultured pearls. The pearl farmer will insert a flat round nucleus made of shell to help the mussel form the shape of a coin, turning the shell so that there is an equal thickness of nacre on both sides of the pearl. This process can take up to a year before the pearl is ready. Button shaped pearls are nice and domed on the top with a slightly flat bottom. This is achieved by putting something of this shape within the mollusk for the pearl to form around it. We stock half drilled button shape pearls which are great for gluing into settings with pegs for earrings and rings. Large hole pearls have been drilled with holes that are larger than usual so that they can be added to thicker wire, hung on chain or threaded on silk or leather cords. Pearls are fairly delicate and require a little TLC to keep them in good condition. As they are relatively soft they can be susceptible to being scratched and damaged. Cosmetics and the natural oil from our skin can also dull the lustre. It is recommended that you apply any perfume, hairspray or other cosmetics before putting your pearls on. After wearing, wipe them with a soft damp cloth to remove any residue and store them separately away from any hard items to avoid scratches. If you pearls are strung on silk it is also a good idea to restring them periodically. How should I string my pearls? Pearls traditionally come strung on silk thread. 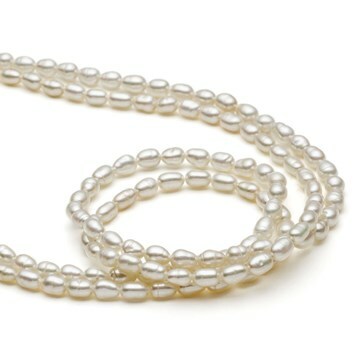 If you wear your pearls very often it is recommended that you re-string them about once a year. For extra security you should knot the thread between each pearl – this will prevent all your pearls falling off the strand if it should break and also stops the pearls from rubbing against each other causing damage. We recommend The Basics of Bead Stringing as a great go-to book for stringing techniques. If you’re looking for a slightly longer-lasting thread we recommend our LS110 Flex-Rite 7 extra fine jewellery wire. At 0.3mm in diameter it is perfect for pearls as they have very small drill holes and it is incredibly strong yet still has a lovely flexible drape. If you have any further questions, feel free to call our friendly team who will be more than happy to give you some advice through Facebook, Twitter, Email or simply calling us on 01872 573888 8.30am-4:30pm.